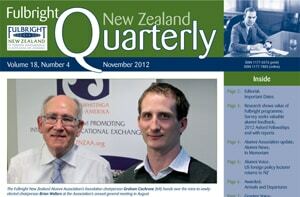 The November 2012 edition of our Fulbright New Zealand Quarterly newsletter is online now! In this issue, read about a recent change in leadership of the Fulbright New Zealand Alumni Association; independent research illustrating the economic benefit of the Fulbright scholarship programme for graduate students; a comprehensive survey of Fulbright alumni; and the launch of research reports by five 2012 Ian Axford (New Zealand) Fellows in Public Policy. 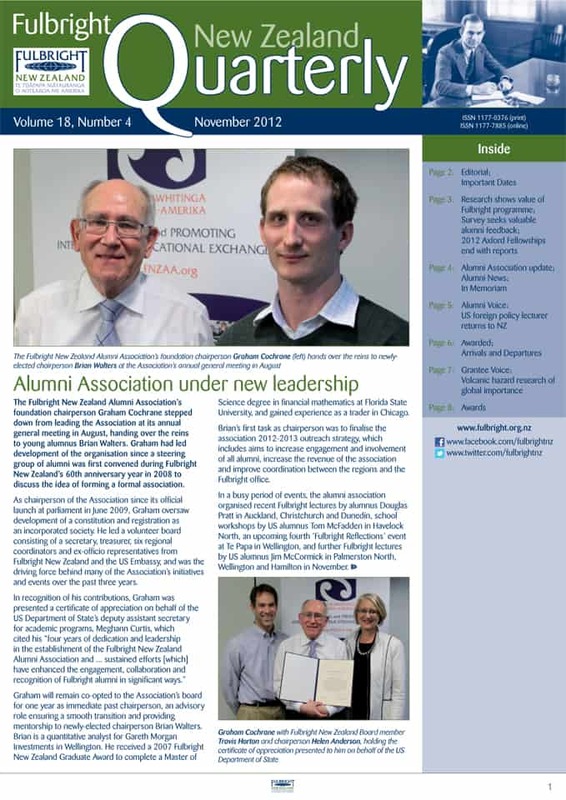 Current Fulbright New Zealand Graduate Student James Muirhead reports on his exchange to the US, alumnus Jim McCormick discusses the upcoming US elections and possible implications of the results for US foreign policy in the years ahead, and we have the usual news updates from the Fulbright New Zealand office and the Fulbright New Zealand Alumni Association, details of our latest grantees, alumni news in brief, and a full list of available awards.